Area youth gathered once again at Mallo Camp north of Newcastle, WY to participate in the Black Hills Natural Resource Youth Camp June 13-15, 2018. The purpose of this camp is to give youth the opportunity to experience a wide variety of activities and educational sessions teaching them about the natural world and its resources. Other activities included fishing, the Wildman Hike teaches kids about predators and prey relationships, a talent show, and various games. Each child participated in six educational sessions they included: “Survival of the Fittest”, “Migration Mayhem”, “Tremendous Trees”, “Casting for Food”, “ Wilderness Scavenger Hunt”, and “Target Practice”. “Migration Mayhem”, presented by Lacey Sloan with the Weston County Natural Resource District taught campers about why animals migrate, how they migrate, and the importance migration to animals. ​In the session “Survival of the Fittest” Nate Fulton explained to the youth the importance of being able to survive in the wilderness if you get lost. He showed the kids the items he carries in his day pack and why each item is important. Nate sent home a few survival items with the kids to place in their own day packs. ​John Marshall taught campers all about “Casting for Food”. This activity taught campers how to cast, fish, and properly care for caught fish. Campers were allowed to practice their casting skills and catch fish. 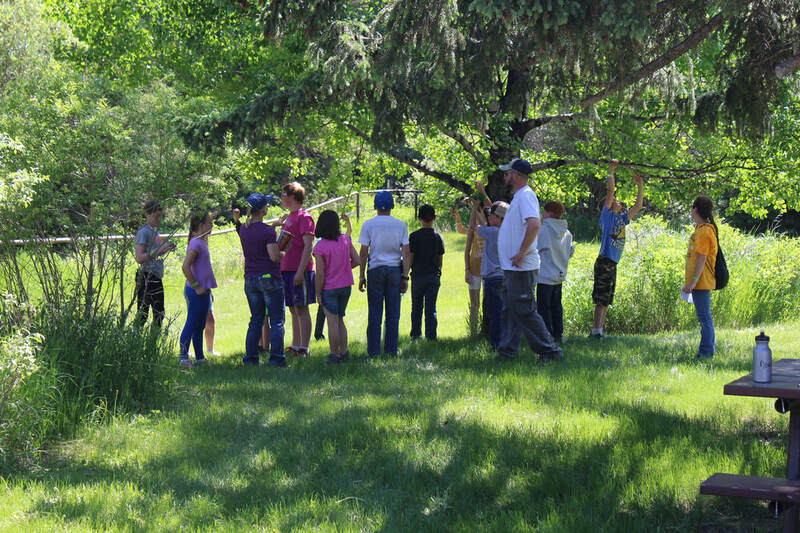 ​​“Wilderness Scavenger Hunt” presented by Brandon Elkins with the WY NRCS, had the kids search nature for items related to animals and their habitats. Items the kids found included a woodpecker hole, bird nest, items animals would eat (seeds, insects, berries), and other animal homes. ​Finally, Bob Pollo and Steve Miller, had “Target Practice”. They taught youth how the correct way to shoot a bow and arrow, safety while shooting and let the kids do a little “target practice”. 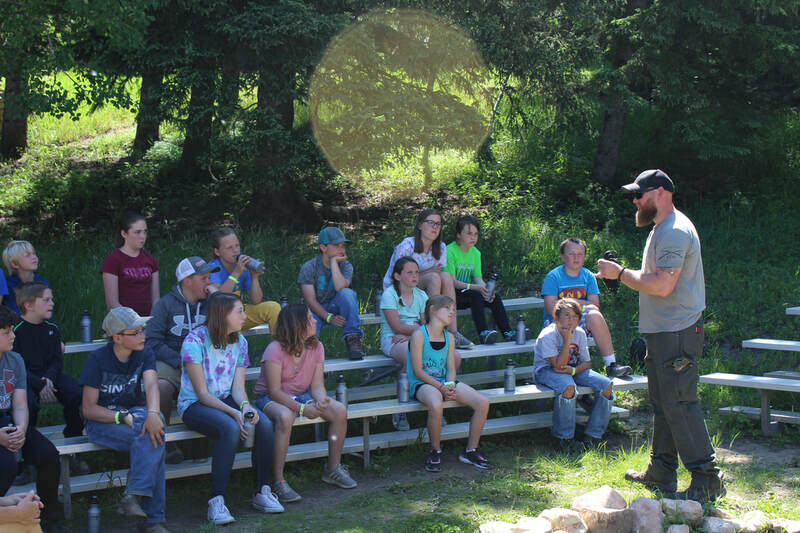 Sponsors for the Black Hills Natural Resource Youth Camp were Weston County Natural Resource District, the Campbell County Conservation District, the Powder River Conservation District and a generous grant received from the Campbell County Community Public Recreation District. The Black Hills Natural Resources Youth Camp has been designed to give young people the opportunity to experience the natural world and its resources through hands-on-activities. Understand natural resources, their use and conservation. Gain more knowledge about the relationship between all the natural resources. Learn some outdoor living skills. Gain appreciation for the beauty and diversity of the natural world. Have lots of fun and meet new friends. The Black ills Natural Resource Youth Camp takes place in the Black Hills, is in a scenic canyon with Stockade Beaver Creek flowing through it. The camp facilities are owned and maintained by Weston County, Wyoming. The Lodge is relatively new and has a very modern kitchen, large dining/recreational area and meeting rooms The campers will stay in cabins with chaperones. There are shower facilities located near separated groupings of cabins to allow for easy access. There are excellent places for fun and learning including a well-stocked trout pond. This years camp is scheduled for June 12-14, 2019. Please check back in May for the registration form.